The other is the clean look and dark colour. These features, along with the general specification should draw in plenty of interesting buyers. The question is, are they pleased with the bike once they take it out and ride it? This Apollo Twilight Mountain/Commute Bike brings together lots of great features for a well-rounded ride. This bike is as a great cross between a mountain bike and a commuter bike. There are lots of great elements to the specification that help it handle both needs. Highlights include the braking, speed and suspension. The Apollo bike is able to handle itself on the road and trail with the 26’’ aluminium wheels with MTB tyres. There are 18 speed gears for different needs. The suspension comes from the front fork and seems to be suitable enough for most riders’ needs. The steel V-brakes are strong and responsive. This model was actually bought by many as a first-time bike for teen girls. Other see this as a commuter bike for young professional women. This is also a good looking bike with a simple colour scheme and shape – nothing that screams that it was designed with teen girls in mind. It was definitely built with a more grown up look for those graduating from childhood bikes onto something more capable and interesting. This Apollo Twilight Womens Mountain Bike can do a lot, but there are still some limitations and drawbacks in its build. This is a cheap mtb compared to some other options, which means that there is plenty that it can’t do. It has cheap plastic pedals that should be upgraded, however a surprisingly comfortable seat at this price point. It doesn’t come with mud guards. In fact, this is an item commonly added to the basket at checkout with this women’s bike. There is also no quick release on the wheel, so it is not as easy to transport up to the trails. Finally, there are some issues with the chain coming off too. Is this Apollo Teen+ Mountain Bike still recommendable with these faults in mind? There are areas where Apollo could improve on this bicycle, but that might push the price up. 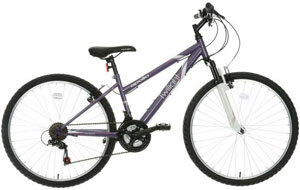 As it stand, this is still a desirable model for both women and teen girls looking for a reliable, all-terrain ride. This is something that can handle different terrain and needs, without getting complicated and difficult to handle. This is important for all those that are new to either road or mountain bike riding. Therefore, it is still easy to recommend this Apollo mountain bike. 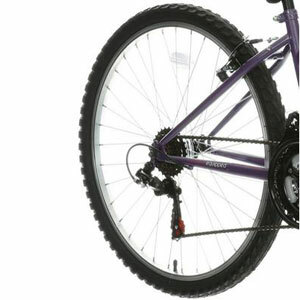 Find more reviews about the Apollo Twilight Womens Mountain Bike on Halfords here.